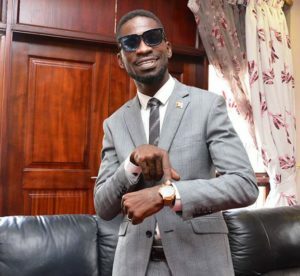 Hon Ssentamu Kyagulanyi is among MPs suspended from Parliament. Courtesy photo. KAMPALA–To keep order in the August House, the Speaker of Parliament, Rebecca Kadaga, has just suspended 25 MPs, including a minister, and ordered them to exit the House. But the legislators refused to get out. The plenary has been adjourned for 30 minutes. Among those who have been suspended include Odongo Otto, Allan Ssewanyana, Ronald Kyagulanyi, Monica Amoding, Sam Lyomoki, Moses Kasibante, Betty Nambooze, Ibrahim Kasozi and Nandala Mafabi. Others are Mubarak Munyagwa, Medard Ssegona, Barnabas Tinkasiimire and Muwanga Kivumbi, among others. Today’s parliamentary sitting is expected to pick up where it left off yesterday with the Opposition and NRM MPs at each other’s throats over a motion on a bill to lift the presidential age limit. Kadaga was expected to swing the axe and suspend a host of members held culpable for yesterday’s chaotic scene in Parliament which ended in fist fights. Kadaga’s “hitlist” will most likely be received with the same acrimony that greeted her announcement that confirmed inclusion of the now controversial Raphael Magyezi age limit motion on the amended order paper. The Mukono North MP Moses Kasibante told PML daily this morning that they will not sit back and meekly accept the any suspensions that will be handed out. “We are fighting for first of all our interests as MPs but also for our interests as Ugandans,” he said defiantly. For the second time in five days the legislators got up and started singing for more than 20 minutes inside the Parliament Chambers in an attempt to block the Raphael Magyezi motion which the speaker had scheduled earlier in the day. Fist fights later broke out when the Speaker insisted on the House listening to Magyezi’s motion first instead of one by Kassanda North MP Patrick Nsamba who they argued had filed his motion first. The Speaker, after a brief interaction with the Clerk, was seen writing down names of MPs singing in the House as she threatened: “I will suspend you.” This too did not deter them from singing and banging tables. The Kassanda South MP Simeo Nsubuga who supports the lifting of age limits believes there will not be a repeat of the chaos that interrupted yesterday’s session. “The Speaker will have to guide us and I’m sure some of these members have to be suspended because you saw what happened yesterday, that is unacceptable,” he said.